In this recipe you will cook the chicken two ways to develop a depth of flavours. Browning the chicken ensures a crispy crust, while braising will infuse the meat with flavour. To pull succulent chicken off the bone, we recommend using tongs so you don’t burn your hands. Before cooking, it helps to quickly pat dry the chicken with a paper towel. Don’t forget that a slight odour is a natural reaction to vacuum packing. Wash the fresh produce. Peel and small dice the onion. Peel carrot and cut into 1 cm dice. Smash garlic with flat side of a knife. Drain and rinse cannellini beans. Pat dry chicken with paper towel. Season both sides of chicken with salt and pepper. Heat olive oil in a medium pot over medium-high heat. When oil is shimmering, add chicken and sear until browned on outside and cooked through, 2 - 3 minutes per side. Transfer to a plate. Return pot to medium heat and immediately add onion, carrot and smashed garlic. Cook until onions are soft and translucent, about 5 minutes. Return chicken to pot. Add chicken stock concentrate and 3 cups water. Increase heat to high to bring to the boil, then reduce heat to medium-low and simmer until beginning to thicken, about 20 minutes. Stir in cannellini beans and cook until chicken is tender, another 10 minutes. Turn off heat and allow to stand until chicken is pulling away from bone, 5 - 10 minutes. Remove chicken from pot and discard any skin. Pull meat off bone and break into bite-size pieces. Return chicken pieces to pot, add baby spinach, and stir to combine. Turn heat to medium-high and bring to a simmer. Taste and season with salt and pepper if necessary. 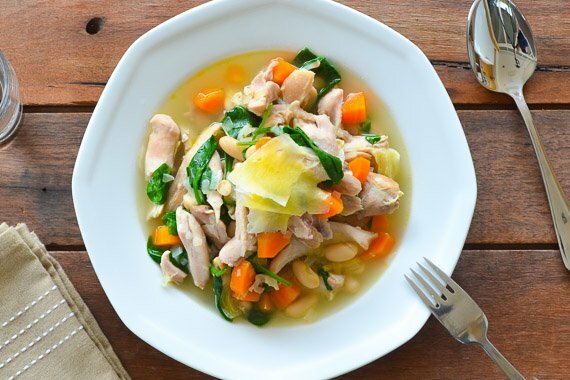 Divide chicken, beans, and baby spinach evenly between bowls. Top with parmesan. Season to taste. Enjoy!